pongal looks mouthwatering!! i too made it yesterday. Happy Pongal to u & ur family. your venpongal makes me tempting.. Looks yum with sambhar..
Pongal looks prefect Priti..Happy Pongal to u n ur family..
yummy yummy Venn Pongal looks delicious with the Sambhar. Happy Pongal to you and to all at home. Looks so good Priti:) I should visit there! That looks lovely... Nice Pic. HOPE YOU HAD FUN! I would love to have that plate. A good traditional recipe! Love pongal, both sweet and savory kinds! Ya, its true when we are out of India, miss all the festivals an function :( !! 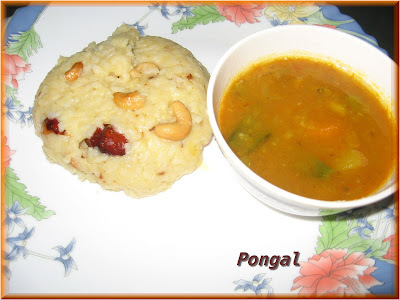 Pongal looks so nice with sambar !! Yum !! I have passed u my entry to ur FF event !! Hi dear, this Pongal I did not make anything special, hence don't know what to send in for the event. I've an older venpongal post, will that do? Yum Yum Ven Pongal, looks tempting!!!!!!!!!!!! Hope you had a gr8 festival time. Pongal looks yummy. I have something for you in my blog....Click here.